In this article I’d like to gather all the essential information regarding this dependency breaking technique. We’ll discuss the implementation (const issue, back pointer, fast impl), pros and cons, alternatives and also show examples where is it used. You’ll also see how modern C++ can change this pattern. Moreover, I hope you’ll help me and provide your examples. A lot has been written about the pimpl pattern. Starting from some old posts by Herb Sutter: GotW #24: Compilation Firewalls and GotW #7b Solution: Minimizing Compile-Time Dependencies. So why would I like to write again about pimpl? First of all, I’d like to make a summary of the essential facts. The pattern is used to break dependencies - both physical and logical of the code. The basics sound simple, but as usual, there’s more to the story. There’s also an important question: should we all use pimpl today? Maybe there are better alternatives? Pimpl might appear with different names: d-pointer, compiler firewall or even Cheshire Cat pattern or Opaque pointer. in the corresponding cpp file we declare the PrivateImpl class and define it. now, if you change the private implementation, the client code won't have to be recompiled (as the interface hasn't changed). So briefly: we pack everything that is private into that forward declared class. We use just one member of our main class - the compiler can work with only the pointer without having full type declaration - as only size of the pointer is needed. Then the whole private declaration & implementation happens in the .cpp file. Of course in modern C++ it’s also advised to use unique_ptr rather than raw pointers. The two obvious downsides of this approach: we need a separate memory allocation to store the private section. And also the main class just forwards the method calls to the private implementation. Ok… but it’s all… right? Not so easy! The above code might work, but we have to add a few bits to make it work in real life. is your class copyable or only movable? how to enforce const for methods in that private implementation? do you need a “backward” pointer - so that the impl class can call/reference members of the main class? what should be put in that private implementation? everything that’s private? The first part - copyable/movable relates to the fact that with the simple - raw - pointer we can only shallow copy an object. Of course, this happens in every case you have a pointer in your class. So, for sure we have to implement copy constructor (or delete it if we want only movable type). What about that const problem? Can you catch it in the basic example? If you declare a method const then you cannot change members of the object. In other words, they become const. But it’s a problem for our m_pImpl which is a pointer. In a const method this pointer will also become const which means we cannot assign a different value to it… but… we can happily call all methods of this underlying private class (not only constant)!. And now, in all of our methods of the main class, we should be using that function wrapper, not the pointer itself. Still, such rule - remembering to use this wrapper accessor - might be hard to follow and keep consistent. If you want to read more about const propagation read my post: How to propagate const on a member pointer? So far, I didn’t mention that “backward” pointer (“q-pointer” in QT terminology). The answer is connected to the last point - what should we put in the private implementation - only private fields? Or maybe even private functions? The basic code won’t show those practical problems. But In a real application, a class might contain a lot of methods and fields. I’ve seen examples where all of the private section (with methods) go to the pimpl class. Still, sometimes the pimpl class need to call a ‘real’ method of the main class, so we need to provide that “back” pointer. This can be done at construction, just pass the pointer to this. To be safe with const methods all of the proxy methods of the main class uses Pimpl() method to fetch the proper type of the pointer. Have a look at this blog Pimp My Pimpl — Reloaded by Marc Mutz for a lot of information about pimpl. As you can see, there’s a bit of code that’s boilerplate. That’s why there are several approaches how to wrap that idiom into a separate utility class. Let’s have a look below. Still, you’re left with the implementation of copy construction if required. If you want a full blown wrapper take a look at this post PIMPL, Rule of Zero and Scott Meyers by Andrey Upadyshev. Inside the library you can find two types: spimpl::unique_impl_ptr - for movable only pimpl, and spimpl::impl_ptr for movable and copyable pimpl wrapper. or reserve a large block of memory in the main class and use placement new to allocate the space for pimpl. Note that reserving space upfront is flaky - what if the size changes? and what’s more important - do you have a proper alignment for the type? Herb Sutter wrote about this idea here GotW #28: The Fast Pimpl Idiom. My Favourite C++ Idiom: Static PIMPL / Fast PIMPL by Kai Dietrich or Type-safe Pimpl implementation without overhead | Probably Dance blog. But be aware that it’s only a trick, might not work. Or it might work on one platform/compiler, but not on the other configuration. In my personal opinion I I don’t see this approach as a good one. Pimp is usually used for larger classes (maybe managers, types in the interfaces of a module), so that additional cost won’t make much. We’ve seen a few core parts of the pimpl pattern, so we can now discuss it strengths and weaknesses. Provides Compilation Firewall: if the private implementation changes the client code don’t have to be recompiled. Headers can become smaller, as types mentioned only in a class implementation need no longer be defined for client code. Provides Binary Compatibility: very important for library developers. As long as the binary interface stays the same, you can link your app with a different version of a library. To simplify, if you add a new virtual method then the ABI changes, but adding non-virtual methods (of course without removing existing ones) doesn’t change ABI. See Fragile Binary Interface Problem. Possible advantage: No v-table (if the main class contains only non-virtual methods). Performance - one level of indirection is added. A memory chunk has to be allocated (or preallocated) for the private implementation. Complex code and it requires some discipline to maintain such classes. Testability - there’s opinion that when you try to test such pimpl class, it might cause problems. But as, usually, you test only the public interface it shouldn’t matter. also based on abstract interfaces, but with some more underlying machinery. As of C++17, we don’t have any new features that target pimpl. With C++11 we got smart pointers, so try to implement pimpl with them - not with raw pointers. Plus of course, we get a whole lot of template metaprogramming stuff that helps when declaring wrapper types for the pimpl pattern. But in the future, we might want to consider two options: Modules and operator dot. Modules will play an important part in reducing the compilation times. I haven’t played with modules a lot, but as I see using pimpl just for the compilation speed might become less and less critical. Of course, keeping dependencies low is always essential. Another feature that might become handy is operator dot - designed by Bjarne Stroustrup and Gabriel Dos Reis. 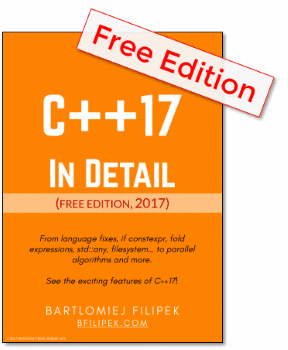 PDF - N4477 - didn’t make for C++17, but maybe will see it in C++20? Basically, it allows to overwrite the dot operator and provide much nicer code for all of the proxy types. This is probably the most prominent examples (that you can find publicly) were private implementation is heavily used. QT also shows how to use pimpl with inheritance. In theory, you need a separate pimpl for every derived class, but QT uses just one pointer. // Holy stuff, only for members of the high council of the Jedi. // Just because we don't want you to know how we're hacking around. Let me know if you have other examples. Pimpl provides ABI compatibility and reduced compilation dependencies. Starting from C++11 you should use unique_ptr (or even shared_ptr) to implement the pattern. To make it working decide if your main class has to be copyable, or just movable. Take care of the const methods so that the private implementation honours them. If the private implementation need to access main class members, then a “back pointer” is needed. Some optimizations are possible (to avoid separate memory allocation), but might be tricky. Next week I’ll show you a practical example - a utility app - where I use pimpl to break compilation dependencies between classes. Later, the project will also serve as a test project for playing with ABI compatibility. I’ll also use Conan - package manager - to streamline my work when third-party libraries are required.